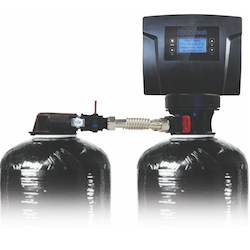 The patent-pending Tank Mate connector allows two-tank water conditioning systems to operate with a single control valve. Installations are fast and easy, and systems are affordable. The connector's design allows two tanks to operate in series, allowing raw water to receive two treatments in one pass. Water conditioning systems that use this connector are suitable for water that requires multiple corrections. These systems come equipped with quick connectors and only require one system to be plumbed in.